♦ In 1637, Abraham Lincoln’s fourth great-grandfather, Samuel Lincoln, emigrates from Norwich, England to the Massachusetts Bay Colony in North America. Later generations of the family migrate out of New England to New Jersey, Pennsylvania and then to Kentucky. ♦ On January 14, 1781, Thomas Lincoln’s cousin, Amos Lincoln, marries Paul Revere’s eldest daughter, Deborah Revere, in Boston. They remain married until Deborah’s unexpected death in 1797. ♦ On May 24, 1797, Amos Lincoln marries another one of Paul Revere’s daughters, Elizabeth Revere, in Boston. Amos Lincoln’s brother, Jedediah Lincoln, marries Elizabeth’s sister, Mary Revere, around the same time. ♦ In December of 1808, Thomas Lincoln purchases 300 acres of land in Sinking Spring, Kentucky. ♦ On February 12, 1809, Abraham Lincoln is born, to Thomas Lincoln and Nancy Hanks Lincoln, on the farm in Sinking Spring, Kentucky. 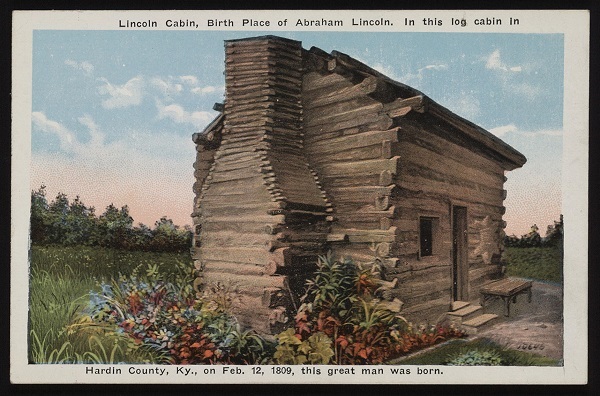 Postcard: Lincoln cabin, birth place of Abraham Lincoln. In this log cabin in Hardin County Kentucky, on Feb. 12, 1809, this great man was born. ♦ In the spring of 1811, the Lincoln family moves to Knob Creek because of title problems with the Sinking Spring Farm due to an old unpaid lien on the property. ♦ In 1812, Thomas Lincoln is born, to Thomas Lincoln and Nancy Hanks Lincoln, but only lives three days. ♦ In December of 1816, the Lincoln family relocates to Spencer County, Indiana. ♦ On December 2, 1819, Abraham’s father, Thomas Lincoln, remarries widow Sarah Bush Johnston. ♦ On January 20, 1828, Abraham’s older sister, Sarah Lincoln Grigsby, dies during childbirth. ♦ In April of 1828, Lincoln works on a cargo flatboat headed for New Orleans. ♦ In March of 1830, the Lincoln family relocates to Macon County, Illinois. ♦ In March of 1831, Lincoln makes second flatboat trip to New Orleans. ♦ Later in 1831, when the Lincoln family moves again, Abraham stays behind and settles in New Salem, Illinois, working at Denton Offutt’s store. Lincoln boards at a local tavern and befriends the owner’s daughter, Ann Rutledge, who many historians believe becomes Lincoln’s first true love. ♦ In March of 1832, Lincoln becomes a candidate for the Illinois House of Representatives. ♦ On April 21, 1832, Lincoln enlists in the Black Hawk War and is elected captain. ♦ On May 29, 1832, Lincoln re-enlists in the Black Hawk War. ♦ On June 20, 1832, Lincoln re-enlists in the Black Hawk War for a third time. ♦ On August 6, 1832, Lincoln loses the race for the Illinois House of Representatives. ♦ In January of 1833, Lincoln and William F. Berry purchase a store in New Salem but it fails and is out of business by the spring. ♦ In May of 1833, Lincoln is appointed Postmaster of New Salem. ♦ In October of 1833, Lincoln begins working as a surveyor. ♦ Also in 1833, Lincoln meets a woman named Mary Owen, of Kentucky, and they begin a courtship. ♦ On August 4, 1834, Lincoln is elected to the Illinois House of Representatives. Lincoln also begins to study law. ♦ On August 25, 1835, Ann Rutledge dies, probably from typhus. ♦ On August 1, 1836, Lincoln is re-elected to the Illinois House of Representatives. ♦ On September 9, 1836, Lincoln receives his license to practice law. ♦ In 1836, Mary Owens visits New Salem, Illinois and resumes her courtship with Lincoln. ♦ In February of 1837, the Illinois General Assembly votes to move the state capital to Springfield. ♦ On March 1, 1837, Lincoln is admitted to the Bar. ♦ On April 15, 1837, Lincoln leaves New Salem and settles in Springfield. He becomes a law partner of John Todd Stuart, Mary Todd’s cousin. ♦ In the fall of 1837, Mary Owens, returns to her home in Kentucky and ends her courtship with Lincoln. ♦ On August 6, 1838, Lincoln is re-elected to the Illinois General Assembly and becomes Whig Floor Leader. ♦ On December 3, 1839, Lincoln is admitted to practice in the United States Circuit Court. ♦ Also in 1839, Lincoln meets Mary Todd, of Lexington, Kentucky, while she is visiting her sister Elizabeth Todd Edwards. ♦ In June of 1840, Lincoln argues his first case before the Illinois Supreme Court. ♦ On August 3, 1840, Lincoln is re-elected to the Illinois General Assembly. ♦ In the fall of 1840, Lincoln and Mary Todd become engaged. ♦ On January 1, 1841, Lincoln and Mary Todd break off their engagement. ♦ In April of 1841, Lincoln forms a new law partnership with Stephen T. Logan. ♦ During the summer of 1842, Lincoln and Mary Todd resume their courtship. ♦ In September of 1842, Lincoln is challenged to a duel by Democratic state auditor James Shields but the duel is averted. ♦ On November 4, 1842, Lincoln marries Mary Todd. ♦ On August 1, 1843, Mary Todd Lincoln gives birth to Robert Todd Lincoln. ♦ In January of 1844, the Lincoln family buy a house in Springfield, Illinois for $1500. ♦ In December of 1844, Lincoln dissolves his law partnership with Logan, and sets up his own practice, Lincoln & Herndon, with his new partner William Herndon. ♦ On March 10, 1846, Mary Todd Lincoln gives birth to their second son, Edward Baker Lincoln. ♦ On May 1, 1846, Lincoln is nominated to be the Whig candidate for U.S. Congress. ♦ On August 3, 1846, Lincoln is elected to Congress as a Whig Representative from Illinois. ♦ In late 1847, the Lincoln family moves into a boarding house in Washington D.C. but Mary soon takes the boys and goes to stay with her stepmother, Betsey Humphreys Todd, in Kentucky. ♦ On December 6, 1847, Lincoln takes his seat in the House of Representatives. ♦ On December 22, 1847, Lincoln declares his opposition to the Mexican-American war, which seems to temporarily derail his political career. During this term, Lincoln also makes his opposition to slavery known. ♦ On January 22, 1848, Lincoln gives a speech on the floor of the house against the Polk administration’s Mexican-American war policies. ♦ In June of 1848, Lincoln attends the Whig Party’s national convention in Philadelphia. ♦ In September of 1848, Lincoln travels through New England on a speaking tour. ♦ In early 1849, Lincoln fails to be appointed commissioner of the General Land Office. ♦ On March 7, 1849, Lincoln is admitted to the bar of the United States Supreme Court. ♦ On March 31, 1849, Lincoln returns to Springfield and begins practicing law again. ♦ On May 22, 1849, Lincoln receives a patent for a device that buoys vessels over shoals. 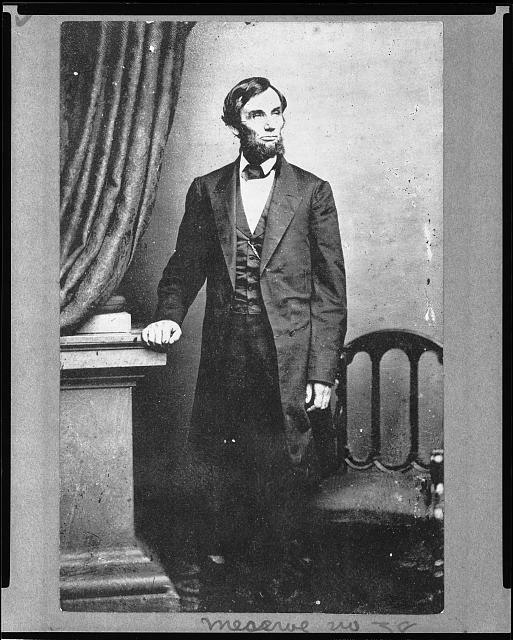 ♦ In July of 1849, Lincoln resumes his law practice in Springfield, Illinois. ♦ In September of 1849, Lincoln declines appointment to be governor of the Oregon Territory. ♦ On February 1, 1850, Edward Lincoln dies a month before his fourth birthday of what was believed to be diphtheria but may have been tuberculosis. ♦ On December 21, 1850, Mary Todd Lincoln gives birth to another son, William Wallace Lincoln. ♦ On January 17, 1851, Lincoln’s father, Thomas Lincoln, dies at the age of 73 of a kidney ailment in Coles County, Illinois. Lincoln does not attend his funeral. ♦ In December of 1851, Lincoln represents the Alton & Sangamon Railroad. ♦ On April 4, 1853, Mary Todd Lincoln gives birth to another son, Thomas Lincoln. ♦ In the Spring of 1854, Lincoln re-enters politics to oppose the Kansas-Nebraska Act and is elected to the Illinois legislature but declines the seat and announces his bid for the Senate. ♦ On October 16, 1854, Lincoln delivers a three-hour speech in Peoria, Illinois while campaigning for a seat in the Illinois House of Representatives. ♦ On February 8, 1855, Lincoln loses the election for U.S. Senator. ♦ In May of 1856, at the first Republican convention, Lincoln gets 110 votes for the vice-presidential nomination but loses the nomination to William Lewis Dayton. ♦ On June 26, 1857, Lincoln speaks out against the Dred Scott decision during a speech in Springfield, Illinois. ♦ On June 16, 1858, Lincoln delivers his “House Divided” speech at Illinois Republican Convention. ♦ On August 21, 1858, Lincoln loses the first of the Lincoln-Douglass debates on slavery. ♦ On November 2, 1858, Lincoln loses the election for U.S. Senator to Stephen A. Douglass. ♦ On February 27, 1860, Lincoln delivers the Cooper Union Address in New York City. ♦ In March of 1860, the Lincoln-Douglass debates are published. ♦ On May 18, 1860, Lincoln is nominated for President at the Republican National Convention in Chicago, Illinois. ♦ In July of 1860, Robert Todd Lincoln enrolls at Harvard University. ♦ On October 15, 1860, Lincoln receives a letter from 11-year-old Grace Bedell of New York who suggests that Lincoln grow a beard to improve the appearance of his thin face. ♦ On November 6, 1860, Lincoln is elected the 16th President of the United States. ♦ On December 20, 1860, South Carolina secedes from the Union in the wake of Lincoln’s election. ♦ On February 11, 1861, Lincoln gives a farewell speech to friends and supporters in Springfield, Illinois and leaves with his family for Washington D.C. by train. ♦ On February 23, 1861, the Lincoln family arrives in Washington D.C.
♦ On March 4, 1861, Lincoln delivers his First Inaugural Address on the steps of the Capital Building. ♦ On April 12, 1861, Confederate artillery opens fire on Fort Sumter in Charleston Harbor. ♦ On April 15, 1861, President Lincoln calls for 75,000 volunteers to serve three months in the Union army to suppress the rebellion. ♦ On August 3, 1861, Lincoln receives a visit from Prince Napoleon at the White House. Later that evening, Napoleon attends a dinner party in his honor at the White House. ♦ On February 20, 1862, William Lincoln dies, at age 11, of typhus in the White House. ♦ On April 16, 1862, Lincoln signs an act that abolishes slavery in the District of Columbia. ♦ On May 20, 1862, Lincoln signs the Federal Homestead Law. ♦ On September 22, 1862, Lincoln issues the preliminary Emancipation Proclamation. ♦ On December 31, 1862, Lincoln signs a bill admitting West Virginia to the Union as the 35th state. ♦ On January 1, 1863, Lincoln issues the final Emancipation Proclamation freeing slaves in territories held by the Confederates. ♦ On November 9, 1863, Abraham Lincoln watches John Wilkes Booth perform at Ford’s Theater and invites Booth to the White House. Booth declines the invitation. ♦ On November 18, 1863, Lincoln comes down with smallpox while en route to give his famous address in Gettysburg, Pa.
♦ On November 19, 1863, Lincoln delivers the Gettysburg Address in a ceremony dedicating the battlefield as a National Cemetery. ♦ On March 9, 1864, Lincoln appoints Ulysses S. Grant as General-In-Chief of the Union Army. ♦ On June 8, 1864, Lincoln is nominated for a second term as President. ♦ On July 26, 1864, John Wilkes Booth reportedly meets with Confederate sympathizers or possibly Confederate Secret Service at the Parker House Hotel in Boston to hatch a plan to kidnap Abraham Lincoln. 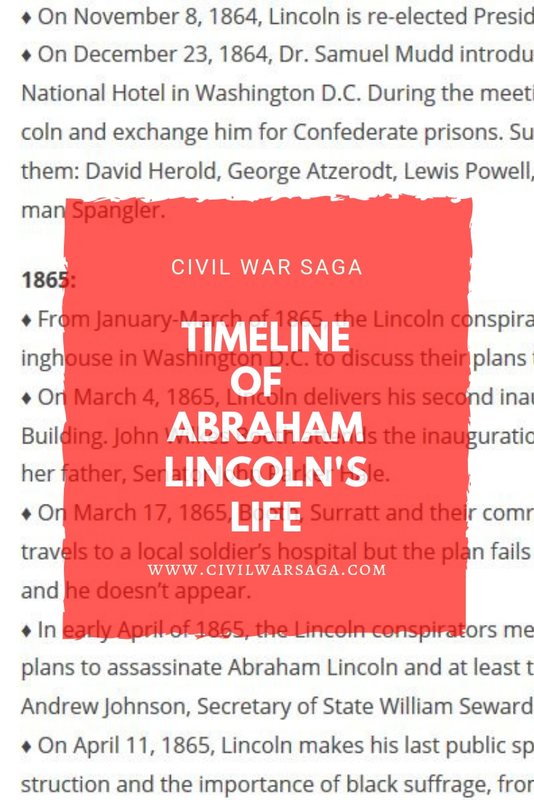 ♦ In August of 1864, a rifle shot from an unknown shooter strikes Lincoln’s hat, knocking it off his head, as he is riding alone on horseback to his family’s summer cottage in the countryside. Although perceived by many as assassination attempt, Lincoln dismisses it as a mere accident. ♦ In August of 1864, Booth recruits two friends, Samuel Arnold and Michael O’Laughlen, to help him kidnap the president. ♦ On November 8, 1864, Lincoln is re-elected President of the United States. ♦ On December 23, 1864, Dr. Samuel Mudd introduces John Surratt to John Wilkes Booth at the National Hotel in Washington D.C. During the meeting, Surratt agrees to help Booth kidnap Lincoln and exchange him for Confederate prisons. Surratt and Booth soon enlist six men to help them: David Herold, George Atzerodt, Lewis Powell, Samuel Arnold, Michael O’Laughlen and Edman Spangler. ♦ From January-March of 1865, the Lincoln conspirators frequently meet at Mary Surratt’s boardinghouse in Washington D.C. to discuss their plans to kidnap Lincoln. ♦ On March 4, 1865, Lincoln delivers his second inaugural address on the steps of the Capital Building. John Wilkes Booth attends the inauguration as a guest of his girlfriend, Lucy Hale, and her father, Senator John Parker Hale. ♦ On March 17, 1865, Booth, Surratt and their comrades plan to ambush Lincoln’s carriage as he travels to a local soldier’s hospital but the plan fails when Lincoln changes his plans last second and he doesn’t appear. ♦ In early April of 1865, the Lincoln conspirators meet at the Surratt boardinghouse to discuss plans to assassinate Abraham Lincoln and at least three other Northern leaders: Vice President Andrew Johnson, Secretary of State William Seward and General Ulysses Grant. 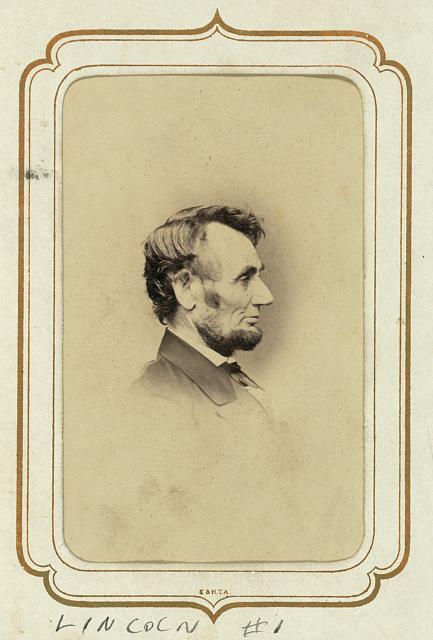 ♦ On April 11, 1865, Lincoln makes his last public speech, which is about the challenges of reconstruction and the importance of black suffrage, from a White House balcony. Booth and Powell attend the speech and Booth reportedly urges Powell to shoot Lincoln on the balcony but Powell dismisses the idea as too risky. ♦ On April 14, 1865, Abraham Lincoln establishes the Secret Service to combat counterfeiters. ♦ On April 14, 1865, Abraham Lincoln and Mary Todd Lincoln attend the play, Our American Cousin, at Ford’s Theater in Washington. D.C. At about 10:13 pm that evening, John Wilkes Booth enters the presidential box at the theater and shoots Abraham Lincoln in the back of the head before fleeing the theater on horseback. Meanwhile, Powell attacks and injures Secretary Seward at his home in Washington D.C. before escaping and Atzerodt abandons his plan to kill Vice President Johnson at the Kirkwood House hotel. ♦ On April 15, 1865, at 7:22 am Abraham Lincoln dies of his wounds at the Peterson boarding house across the street from Ford’s Theater. ♦ On April 17, 1865, Mary Surratt and Lewis Powell are arrested at her boardinghouse and are taken early the next morning to the Carroll Annex of the Old Capitol Prison in Washington D.C.
♦ On April 19, 1865, Lincoln’s funeral procession proceeds down Pennsylvania Avenue. ♦ On April 20, 1865, George Atzerodt is captured in northwest Maryland. ♦ On April 21, 1865, Lincoln’s funeral train begins its journey from Washington, D.C. to Springfield, Illinois. ♦ On April 26, 1865, David Herold and John Wilkes Booth are discovered in a barn in Virginia. Herold surrenders but Booth refuses and is shot and killed by Union officer Boston Corbett. ♦ On April 30, 1865, Mary Surratt is transported to the Washington Arsenal Penitentiary. ♦ On May 1, 1865, President Andrew Johnson orders that the Lincoln conspirators be tried by a military commission. ♦ On May 4, 1865, Lincoln is laid to rest in the public receiving vault in Oak Ridge Cemetery in Springfield, Illinois. ♦ On May 9, 1865, the Military Commission meets for the first time. ♦ On May 10, 1865, the Lincoln conspirators, David Herold, George Azterodt, Lewis Powell, Mary Surratt, Samuel Mudd, Samuel Arnold, Michael O’Laughlen and Edman Spangler, are arraigned before the military commission. ♦ On May 12, 1865, testimony begins in the Lincoln assassination conspiracy trial at the Old Arsenal Building in Washington D.C. Another possible conspirator, Sarah Slater, is mentioned during the trials but was never found. ♦ On June 29, 1865, the military commission begins reviewing the trial evidence. ♦ On June 30, 1865, Herold, Azterodt, Powell and Surratt are sentenced to death while Samuel Mudd, Samuel Arnold, Michael O’Laughlen and Edman Spangler are sentenced to life in prison. ♦ On July 7, 1865, four of the convicted Lincoln conspirators, David Herold, George Azterodt, Lewis Powell and Mary Surratt, are hanged at what is now Fort Lesley J. McNair in Washington D.C.
♦ On November 23, 1866, John Surratt is captured in Egypt. ♦ On June 10 – August 11, 1867, John Surratt is tried for the assassination of Abraham Lincoln but it results in a mistrial when the jury is unable to reach a verdict. ♦ On September 23, 1867, convicted Lincoln conspirator Michael O’Laughlen dies in prison. ♦ On February 8, 1869, convicted Lincoln conspirator Samuel Mudd is pardoned and released. ♦ On March 1, 1869, convicted Lincoln conspirators Samuel Arnold and Edman Spangler are pardoned and released. ♦ On September 9, 1869, officials break ground on the construction of Lincoln’s tomb at the Oak Ridge Cemetery in Springfield, Illinois. ♦ On July 17, 1871, Lincoln’s youngest son, Thomas Lincoln, is buried in the partially constructed Lincoln tomb after dying at age 18 in Chicago, Illinois. ♦ On September 19, 1871, Lincoln and his sons Edward and William are moved to the Lincoln tomb. Lincoln’s coffin is opened and his remains are identified. ♦ On October 9, 1874, Lincoln’s remains are identified again when his body is moved to a cedar coffin with a lead lining and placed in a marble sarcophagus. ♦ On November 7, 1876, a Chicago gang of counterfeiters, led by crime boss Big Jim Kennally, break into Lincoln’s tomb in Illinois in order to steal and ransom his body. The plot fails when the gang discovers they have been infiltrated by the Secret Service who arrive to arrest them. The grave robbers manage to escape. Soon after, Lincoln’s coffin is hidden inside the tomb to prevent future grave robbing attempts, leaving the sarcophagus empty. ♦ On November 17, 1876, the Lincoln grave robbers are finally captured in Chicago. They go to trial sometime the following year and, because grave robbing wasn’t an official crime yet, are convicted of the attempted theft of Lincoln’s coffin and are sentenced to one year in Joliet State Prison. ♦ On November 21, 1878, Lincoln’s coffin is reburied in a shallow grave in another secret location within the Lincoln tomb. 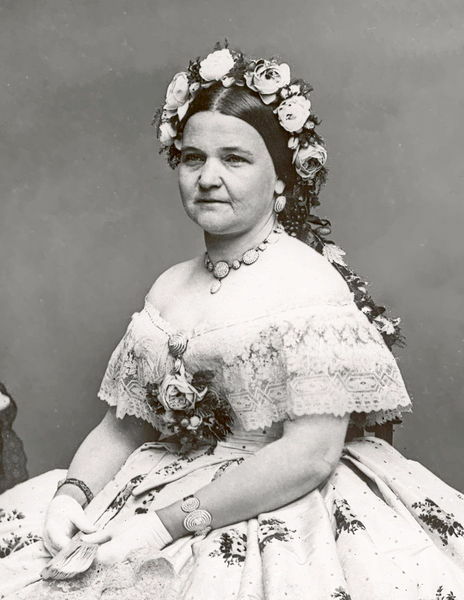 ♦ On July 19, 1882, Mary Todd Lincoln is buried in the Lincoln tomb after she dies in Springfield, Illinois at age 63. 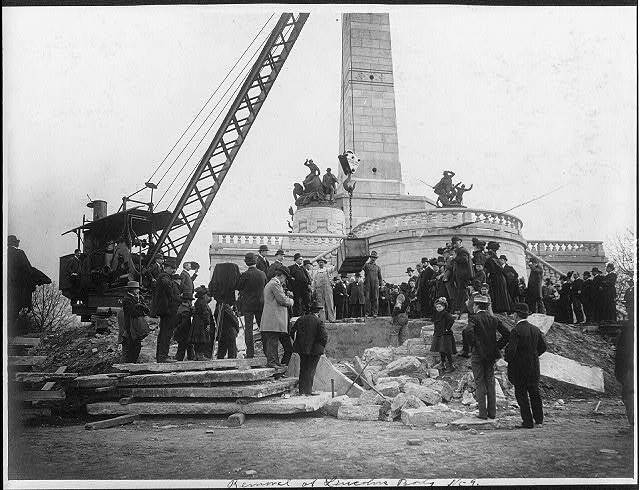 ♦ On April 14, 1887, due to repairs on the Lincoln tomb, the remains of the Lincolns are moved to a new brick burial vault and Lincoln’s coffin is opened again for identification. ♦ On March 10, 1900, Lincoln’s coffin is moved from the brick vault to an underground vault near the Lincoln tomb. 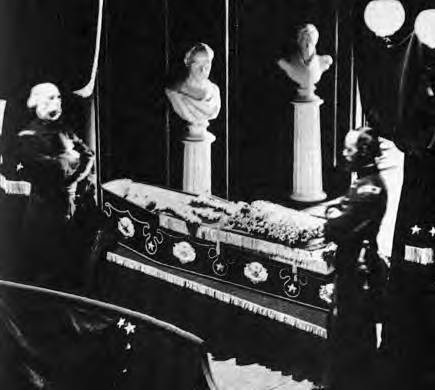 ♦ On April 24, 1901, Lincoln’s coffin is moved back to the sarcophagus in the Lincoln tomb. ♦ In May of 1901, Robert Todd Lincoln orders that his father be buried in a steel cage under several tons of concrete inside a 10-feet-deep vault to insure the body will not be disturbed again. ♦ In July of 1901, Lincoln’s coffin is moved from the sarcophagus to a tomb crypt while the Lincoln tomb is being renovated. ♦ On September 26, 1901, before Lincoln is buried in the steel and concrete-enforced vault under the floor of the Lincoln tomb, his coffin is opened one last time and his remains are identified. ♦ In 1909, to celebrate the centennial of Lincoln’s birth, his image is placed on the one-cent piece. ♦ In 1914, Lincoln’s face is placed on the first five-dollar Federal Reserve Bank Note. ♦ In March of 1914, construction begins on the Lincoln Memorial in Washington D.C.
♦ On May 30, 1922, President Warren G. Harding officially dedicates the Lincoln Memorial in Washington, D.C. Robert Todd Lincoln attends the ceremony. Lamon, Ward Hill. 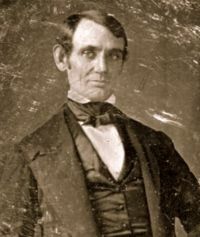 Recollections of Abraham Lincoln, 1847-1865. Chicago: A.C. McClurg and Company, 1895.